The latest reviewed version was checked on 4 March 2018. There is 1 pending change awaiting review. Agile software development is a group of software development methodologies based on iterative and incremental development, where requirements and solutions evolve through collaboration between self-organizing, cross-functional teams. The Agile Manifesto introduced the term in 2001. Incremental software development methods have been traced back to 1957. In 1974, a paper by E. A. Edmonds introduced an adaptive software development process. So-called "lightweight" software development methods evolved in the mid-1990s as a reaction against "heavyweight" methods, which were characterized by their critics as a heavily regulated, regimented, micromanaged, waterfall model of development. Proponents of lightweight methods (and now "agile" methods) contend that they are a return to development practices from early in the history of software development. Early implementations of lightweight methods include Scrum (1995), Crystal Clear, Extreme Programming (1996), Adaptive Software Development, Feature Driven Development, and Dynamic Systems Development Method (DSDM) (1995). These are now typically referred to as agile methodologies, after the Agile Manifesto published in 2001. In February 2001, 17 software developers met at a ski resort in Snowbird, Utah, to discuss lightweight development methods. They published the "Manifesto for Agile Software Development" to define the approach now known as agile software development. Some of the manifesto's authors formed the Agile Alliance, a nonprofit organization that promotes software development according to the manifesto's principles. Agile methods break tasks into small increments with minimal planning, and do not directly involve long-term planning. Iterations are short time frames (timeboxes) that typically last from one to four weeks. Each iteration involves a team working through a full software development cycle including planning, requirements analysis, design, coding, unit testing, and acceptance testing when a working product is demonstrated to stakeholders. This minimizes overall risk and allows the project to adapt to changes quickly. Stakeholders produce documentation as required. An iteration may not add enough functionality to warrant a market release, but the goal is to have an available release (with minimal bugs) at the end of each iteration. Multiple iterations may be required to release a product or new features. Team composition in an agile project is usually cross-functional and self-organizing without consideration for any existing corporate hierarchy or the corporate roles of team members. Team members normally take responsibility for tasks that deliver the functionality an iteration requires. They decide individually how to meet an iteration's requirements. Agile methods emphasize face-to-face communication over written documents when the team is all in the same location. Most agile teams work in a single open office (called a bullpen), which facilitates such communication. Team size is typically small (5-9 people) to simplify team communication and team collaboration. Larger development efforts may be delivered by multiple teams working toward a common goal or on different parts of an effort. This may require a co-ordination of priorities across teams. When a team works in different locations, they maintain daily contact through videoconferencing, voice, e-mail, etc. No matter what development disciplines are required, each agile team will contain a customer representative. This person is appointed by stakeholders to act on their behalf and makes a personal commitment to being available for developers to answer mid-iteration problem-domain questions. At the end of each iteration, stakeholders and the customer representative review progress and re-evaluate priorities with a view to optimizing the return on investment (ROI) and ensuring alignment with customer needs and company goals. Most agile implementations use a routine and formal daily face-to-face communication among team members. This specifically includes the customer representative and any interested stakeholders as observers. In a brief session, team members report to each other what they did the previous day, what they intend to do today, and what their roadblocks are. This face-to-face communication exposes problems as they arise. Agile development emphasizes working software as the primary measure of progress. This, combined with the preference for face-to-face communication, produces less written documentation than other methods. The agile method encourages stakeholders to prioritize wants with other iteration outcomes based exclusively on business value perceived at the beginning of the iteration. Specific tools and techniques such as continuous integration, automated or xUnit test, pair programming, test driven development, design patterns, domain-driven design, code refactoring and other techniques are often used to improve quality and enhance project agility. Agile methods are sometimes characterized as being at the opposite end of the spectrum from "plan-driven" or "disciplined" methods; agile teams may, however, employ highly disciplined formal methods. A more accurate distinction is that methods exist on a continuum from "adaptive" to "predictive". Agile methods lie on the "adaptive" side of this continuum. Adaptive methods focus on adapting quickly to changing realities. When the needs of a project change, an adaptive team changes as well. An adaptive team will have difficulty describing exactly what will happen in the future. The further away a date is, the more vague an adaptive method will be about what will happen on that date. An adaptive team cannot report exactly what tasks are being done next week, but only which features are planned for next month. When asked about a release six months from now, an adaptive team may only be able to report the mission statement for the release, or a statement of expected value vs. cost. Predictive methods, in contrast, focus on planning the future in detail. A predictive team can report exactly what features and tasks are planned for the entire length of the development process. Predictive teams have difficulty changing direction. The plan is typically optimized for the original destination and changing direction can require completed work to be started over. Predictive teams will often institute a change control board to ensure that only the most valuable changes are considered. Formal methods, in contrast to adaptive and predictive methods, focus on computer science theory with a wide array of types of provers. A formal method attempts to prove the absence of errors with some level of determinism. Some formal methods are based on model checking and provide counter examples for code that cannot be proven. Generally, mathematical models (often supported through special languages see SPIN model checker) map to assertions about requirements. Formal methods are dependent on a tool driven approach, and may be combined with other development approaches. Some provers do not easily scale. Like agile methods, manifestos relevant to high integrity software have been proposed in Crosstalk. Agile methods have much in common with the "Rapid Application Development" techniques from the 1980/90s as espoused by James Martin and others. A process or capability in which human agents through responsive changes in, and dynamic interplays between contexts, intentions, and method fragments determine a system development approach for a specific project situation. Extreme Programming (XP) makes the need for method adaptation explicit. One of the fundamental ideas of XP is that no one process fits every project, but rather that practices should be tailored to the needs of individual projects. Partial adoption of XP practices, as suggested by Beck, has been reported on several occasions. A tailoring practice is proposed by Mehdi Mirakhorli which provides sufficient roadmap and guideline for adapting all the practices. RDP Practice is designed for customizing XP. This practice, first proposed as a long research paper in the APSO workshop at the ICSE 2008 conference, is currently the only proposed and applicable method for customizing XP. Although it is specifically a solution for XP, this practice has the capability of extending to other methodologies. At first glance, this practice seems to be in the category of static method adaptation but experiences with RDP Practice says that it can be treated like dynamic method adaptation. The distinction between static method adaptation and dynamic method adaptation is subtle. The key assumption behind static method adaptation is that the project context is given at the start of a project and remains fixed during project execution. The result is a static definition of the project context. Given such a definition, route maps can be used in order to determine which structured method fragments should be used for that particular project, based on predefined sets of criteria. Dynamic method adaptation, in contrast, assumes that projects are situated in an emergent context. An emergent context implies that a project has to deal with emergent factors that affect relevant conditions but are not predictable. This also means that a project context is not fixed, but changing during project execution. In such a case prescriptive route maps are not appropriate. The practical implication of dynamic method adaptation is that project managers often have to modify structured fragments or even innovate new fragments, during the execution of a project (Aydin et al., 2005). While agility can be seen as a means to an end, a number of approaches have been proposed to quantify agility. Agility Index Measurements (AIM) score projects against a number of agility factors to achieve a total. The similarly-named Agility Measurement Index, scores developments against five dimensions of a software project (duration, risk, novelty, effort, and interaction). Other techniques are based on measurable goals. Another study using fuzzy mathematics has suggested that project velocity can be used as a metric of agility. There are agile self assessments to determine whether a team is using agile practices (Nokia test, Karlskrona test, 42 points test). While such approaches have been proposed to measure agility, the practical application of such metrics has yet to be seen. One of the early studies reporting gains in quality, productivity, and business satisfaction by using Agile methods was a survey conducted by Shine Technologies from November 2002 to January 2003. A similar survey conducted in 2006 by Scott Ambler, the Practice Leader for Agile Development with IBM Rational's Methods Group reported similar benefits. In a survey conducted by VersionOne in 2008, 55% of respondents answered that Agile methods had been successful in 90-100% of cases. Others claim that agile development methods are still too young to require extensive academic proof of their success. Large-scale agile software development remains an active research area. Agile development has been widely documented (see Experience Reports, below, as well as Beck pg. 157, and Boehm and Turner) as working well for small (<10 developers) co-located teams. Mission-critical systems where failure is not an option at any cost (e.g. software for surgical procedures). Several successful large-scale agile projects have been documented.Template:Where BT has had several hundred developers situated in the UK, Ireland and India working collaboratively on projects and using Agile methods. In terms of outsourcing agile development, Michael Hackett, Sr. Vice President of LogiGear Corporation has stated that "the offshore team. . . should have expertise, experience, good communication skills, inter-cultural understanding, trust and understanding between members and groups and with each other." Agile development has been the subject of several conferences. Some of these conferences have had academic backing and included peer-reviewed papers, including a peer-reviewed experience report track. The experience reports share industry experiences with agile software development. ↑ a b c Beck, Kent; et al. (2001). "Manifesto for Agile Software Development". Agile Alliance. http://agilemanifesto.org/. Retrieved 2010-06-14. ↑ a b Gerald M. Weinberg, as quoted in Larman, Craig; Basili, Victor R. (June 2003). "Iterative and Incremental Development: A Brief History". Computer 36 (6): 47–56. doi:10.1109/MC.2003.1204375. ISSN 0018-9162. "We were doing incremental development as early as 1957, in Los Angeles, under the direction of Bernie Dimsdale [at IBM's ServiceBureau Corporation]. He was a colleague of John von Neumann, so perhaps he learned it there, or assumed it as totally natural. I do remember Herb Jacobs (primarily, though we all participated) developing a large simulation for Motorola, where the technique used was, as far as I can tell .... All of us, as far as I can remember, thought waterfalling of a huge project was rather stupid, or at least ignorant of the realities. I think what the waterfall description did for us was make us realize that we were doing something else, something unnamed except for 'software development.'". ↑ Edmonds, E. A. (1974). "A Process for the Development of Software for Nontechnical Users as an Adaptive System". General Systems 19: 215–18. ↑ Beck, Kent; et al. (2001). "Principles behind the Agile Manifesto". Agile Alliance. http://www.agilemanifesto.org/principles.html. Retrieved 2010-06-06. ↑ Anderson, David (2005). "Declaration of Interdependence". http://pmdoi.org. ↑ Beck, Kent (1999). "Embracing Change with Extreme Programming". Computer 32 (10): 70–77. doi:10.1109/2.796139. ↑ Black, S. E.; Boca., P. P.; Bowen, J. P.; Gorman, J.; Hinchey, M. G. (September 2009). "Formal versus agile: Survival of the fittest". IEEE Computer 49 (9): 39–45. ↑ "David Bock's Weblog : Weblog". Jroller.com. http://jroller.com/page/bokmann?entry=improving_your_processes_aim_high. Retrieved 2010-04-02. ↑ "Agility measurement index". Doi.acm.org. http://doi.acm.org/10.1145/1185448.1185509. Retrieved 2010-04-02. ↑ Peter Lappo; Henry C.T. Andrew. "Assessing Agility". http://www.smr.co.uk/presentations/measure.pdf. Retrieved 2010-06-06. ↑ Kurian, Tisni (2006). "Agility Metrics: A Quantitative Fuzzy Based Approach for Measuring Agility of a Software Process" ISAM-Proceedings of International Conference on Agile Manufacturing'06(ICAM-2006), Norfolk, U.S.
↑ Joe Little (2007-12-02). "Nokia test, A Scrum specific test". Agileconsortium.blogspot.com. http://agileconsortium.blogspot.com/2007/12/nokia-test.html. Retrieved 2010-06-06. ↑ Mark Seuffert, Piratson Technologies, Sweden. "Karlskrona test, A generic agile adoption test". Piratson.se. http://www.piratson.se/archive/Agile_Karlskrona_Test.html. Retrieved 2010-06-06. ↑ "How agile are you, A Scrum specific test". Agile-software-development.com. http://www.agile-software-development.com/2008/01/how-agile-are-you-take-this-42-point.html. Retrieved 2010-06-06. ↑ "Agile Methodologies Survey Results" (PDF). Shine Technologies. 2003. http://www.shinetech.com/attachments/104_ShineTechAgileSurvey2003-01-17.pdf. Retrieved 2010-06-03. "95% [stated] that there was either no effect or a cost reduction . . . 93% stated that productivity was better or significantly better . . . 88% stated that quality was better or significantly better . . . 83% stated that business satisfaction was better or significantly better"
↑ Ambler, Scott (August 3, 2006). "Survey Says: Agile Works in Practice". Dr. Dobb's. http://www.drdobbs.com/architecture-and-design/191800169;jsessionid=2QJ23QRYM3H4PQE1GHPCKH4ATMY32JVN?queryText=agile+survey. Retrieved 2010-06-03. "Only 6 percent indicated that their productivity was lowered . . . No change in productivity was reported by 34 percent of respondents and 60 percent reported increased productivity. . . . 66 percent [responded] that the quality is higher. . . . 58 percent of organizations report improved satisfaction, whereas only 3 percent report reduced satisfaction." ↑ "The State of Agile Development" (PDF). VersionOne, Inc.. 2008. http://www.versionone.com/pdf/3rdAnnualStateOfAgile_FullDataReport.pdf. Retrieved 2010-07-03. "Agile delivers"
↑ "Answering the "Where is the Proof That Agile Methods Work" Question". Agilemodeling.com. 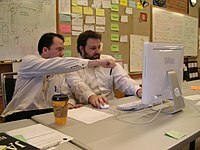 2007-01-19. http://www.agilemodeling.com/essays/proof.htm. Retrieved 2010-04-02. ↑ a b W. Scott Ambler (2006) "Supersize Me" in Dr. Dobb's Journal, February 15, 2006. ↑ Beck, K. (1999). Extreme Programming Explained: Embrace Change. Boston, MA: Addison-Wesley. ISBN 0-321-27865-8. ↑ a b c d Boehm, B.; R. Turner (2004). Balancing Agility and Discipline: A Guide for the Perplexed. Boston, MA: Addison-Wesley. pp. 55–57. ISBN 0-321-18612-5. ↑ "Bridging the Distance". Sdmagazine.com. http://www.drdobbs.com/architecture-and-design/184414899. Retrieved 2011-02-01. ↑ Martin Fowler. "Using an Agile Software Process with Offshore Development". Martinfowler.com. http://www.martinfowler.com/articles/agileOffshore.html. Retrieved 2010-06-06. ↑ "2006". Virtual.vtt.fi. http://virtual.vtt.fi/virtual/xp2006/. Retrieved 2010-06-06. ↑ "2010". Xp2010.org. http://www.xp2010.org/. Retrieved 2010-06-06. ↑ "Agile Development Conference". Agile200x.org. http://www.agile200x.org/. Retrieved 2010-06-06. Abrahamsson, P., Salo, O., Ronkainen, J., & Warsta, J. (2002). Agile Software Development Methods: Review and Analysis. VTT Publications 478. Cohen, D., Lindvall, M., & Costa, P. (2004). An introduction to agile methods. In Advances in Computers (pp. 1–66). New York: Elsevier Science. Dingsøyr, Torgeir, Dybå, Tore and Moe, Nils Brede (ed. ): Agile Software Develoment: Current Research and Future Directions, Springer, Berlin Heidelberg, 2010. Fowler, Martin. Is Design Dead?. Appeared in Extreme Programming Explained, G. Succi and M. Marchesi, ed., Addison-Wesley, Boston. 2001. Riehle, Dirk. A Comparison of the Value Systems of Adaptive Software Development and Extreme Programming: How Methodologies May Learn From Each Other. Appeared in Extreme Programming Explained, G. Succi and M. Marchesi, ed., Addison-Wesley, Boston. 2001.